Browse the range of electric roof windows here at Roof Windows 4 You to discover powered windows that use remote control operation for an easier and much more convenient method of closing and opening. These units are suitable for roof pitches between 15 and 90 degrees. These powered windows are available in white acrylic, white PU, and natural pine finishes, as well as a conservation style design to fit into buildings where conservation restrictions apply. Installing a FAKRO electric roof window allows you to control the operation of your window at the flick of a switch, removing any need to climb on furniture or use a window control rod. This can also give you more options when it comes to where you want to install a roof window, such as within a high ceiling. Each of the electric rooflights in this range are made with FAKRO's signature build quality. We use FSC-certified pine and high-grade glazing, combined with expert craftsmanship, for the best products on the market. They also use a centre pivot mechanism that allows for reliable operation and easy cleaning. Our electric opening roof windows also benefit from some of the best features of our regular centre pivot windows, including an automatic air inlet V40P for balanced air flow and our topSafe anti-burglary system for added security. 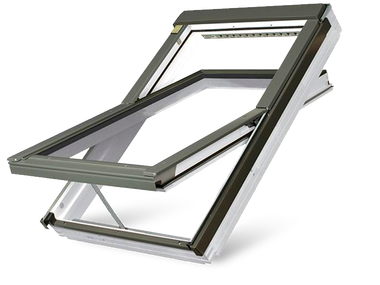 You may also be interested in our electric roof window accessories, which are fully compatible with these units. Take a look at the electric rooflights here and we're sure you'll find a style that suits your loft conversion or extension. Feel free to get in touch if you would like to find out more about these products. By installing Z-Wave roof windows you are in control at the flick of a switch without climbing on the furniture to close the windows. When it starts to rain the windows automatically close due to its rain sensor.